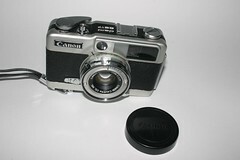 The Canon Demi is a half frame camera, 'Demi' being the French word for "half". It uses ordinary cartridge style 35mm film, but takes two 24 x 18mm exposures in the place of a normal 24 x 36mm film frame. This means a 36 exposure roll will actually hold 72 separate half frame photos. This could be quite a saving per exposure for a simple snapshot camera: economics was the reason for the half frame cameras of the sixties. Color film was very expensive in comparison to B&W films at the time. The Demi is a beautiful child of the sixties. Yet its styling was ahead of its time. It looks more at home among the modern electronic point and shoots than it does among its heavy rangefinder Canonet and SLR contemporaries. Its sleek, metal body panels wrap around rounded corners giving the camera a comfortable feel in one's hands. The first Demi was introduced in February of 1963, by no means was it the first half frame camera. (The very first half frame was the 1908 Lleo, since it was the first still camera to use perforated 35mm film. 35mm movie cameras expose frames the same size and orientation as a half frame camera. So in reality 35mm still cameras are "double frame" cameras.) It wasn’t the first from the big Japanese makers either. The very popular Olympus Pen cameras were first released in 1959. By the end of 1963 Demis came in four colors: the original black leatherette, red, white, and blue. The latter three colors were quickly discontinued. 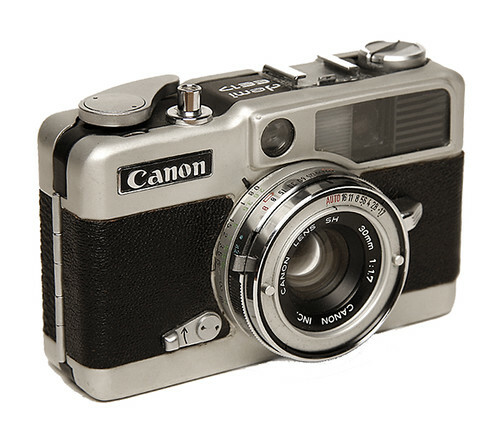 Then in September of 1964 Canon released a higher end version: the Demi S. It had a better lens (30mm f/1.7 instead of the original 28mm f/2.8) and improved metering system. In April of 1965 an interchangeable lens version came out: the Demi C. It had two lenses that only fit the Demi C: a 28mm f/2.8 and a 50mm f/2.8. The Demi Rapid came out in June of 1965. It was basically a Demi S with the new fad "rapid loading system" a battery operated Cds metering system and a self timer. May of 1966 saw the debut of the top of the line Demi EE17. It was a Demi Rapid without the rapid film loading spool. Progress! The final Demi was the Demi EE28. 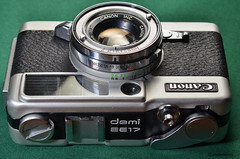 It was released in April of 1967 and was a giant step backwards from the Demi EE17 having a selenium cell metering system and the 28mm f/2.8 lens.